May 6, 2014 – Science Technology Engineering and Math (STEM) education took center stage today at the Colorado Convention Center, where Lockheed Martin announced an $800,000 STEM investment in partnership with Project Lead The Way and the Denver Public Schools Foundation to expand STEM programming for Denver Public Schools (DPS) students. The Lockheed Martin investment will underwrite the cost of implementing Project Lead The Way’s STEM-based curricula at up to 100 elementary, middle and high schools in DPS over a three-year period, depending on grade level and scope of program implementation. Project Lead The Way is a nonprofit organization that provides transformative learning experiences for K-12 students and teachers across the United States through pathways in computer science, engineering and biomedical science. 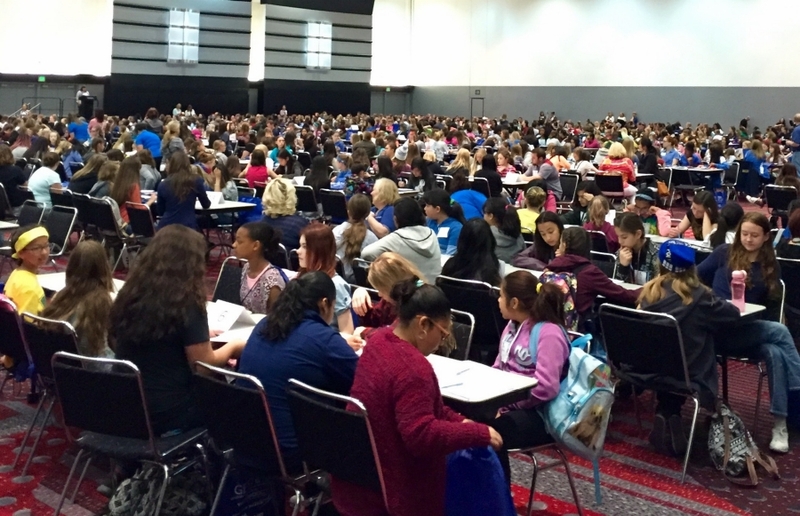 The announcement was held in conjunction with a Society of Women Engineers’ Girls Exploring Science, Technology, Engineering and Math event—where more than 1,000 middle school girls participated in science and technology activities. Denver Public School students who participated received a taste of how science and math can be fun and help solve real-world problems. Verónica Figoli, president and CEO of the Denver Public Schools Foundation, spoke about why it’s important to continue STEM momentum in the classroom and how the Lockheed Martin investment will help make this possible. “We’re absolutely thrilled to be able to introduce more students to the STEM environment by bringing compelling, career-focused STEM content into more classrooms,” she explained. STEM education is the foundation for the nation’s future, particularly in the aerospace industry that thrives in Colorado. With the second largest aerospace economy in the nation, Colorado has a need to fill its talent pipeline with skilled, technical graduates—the base of which is built upon early access to STEM education. On a national level, the U.S. Department of Education estimates a supply demand gap of 1.3 million in STEM talent by 2020 in the U.S., which only further increases the need for widespread STEM education like the programming offered by Project Lead The Way. Mark Valerio, vice president, Enterprise Solutions and Integration for Lockheed Martin Space Systems, underscored the tremendous impact that STEM programming has on industry sustainability. Lockheed Martin has committed $6 million nationally to expand Project Lead The Way programs in select U.S. school districts. In addition to Denver, Lockheed Martin has similar partnerships in Huntsville, Alabama; Fort Worth, Texas; Orange County, Florida; and Washington, D.C. The grant funding covers program implementation costs, including Project Lead The Way teacher professional development training, software, classroom equipment and supplies. In addition to the grant funding, Lockheed Martin engineers volunteer in classrooms—building relationships with students as both role models and mentors. Lockheed Martin has partnered with Project Lead the Way to help implement STEM Curriculum in school districts across the U.S. since 2007. In 2015, Lockheed Martin directed $13 million and nearly 110,000 volunteer hours specifically to STEM initiatives.